Philadelphia Flyers forward Wayne Simmonds will miss the next two to three weeks with an upper-body injury. When the Flyers announced on Monday night that they had recalled prospect Oskar Lindblom from the Phantoms, it was clear something was going on. And it was. A few hours later, the team acquired Red Wings backup goalie Petr Mrazek for a pair of conditional draft picks and announced that Michal Neuvirth, who had taken over the starting job when Brian Elliott was forced to undergo abdominal surgery last week, would be out for weeks, not days. However, that didn't explain the Lindblom move. When asked about the decision to recall the 21-year-old left wing, Flyers general manager Ron Hextall said there would be more injury news coming on Tuesday. 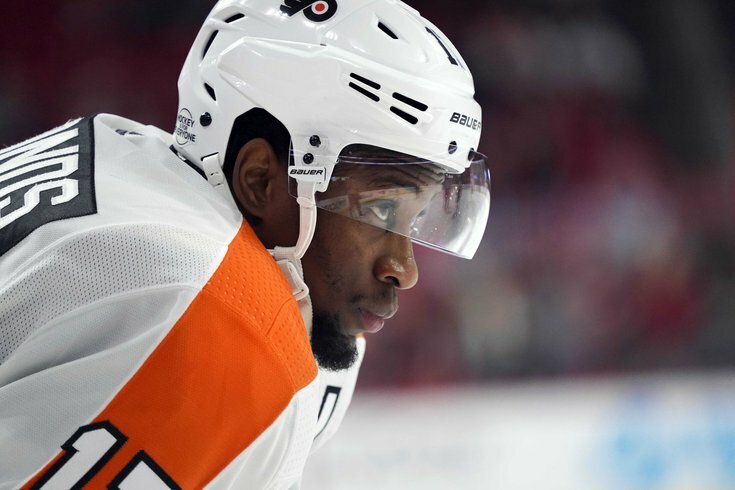 That news, unfortunately, involves one of the Flyers' best players, forward Wayne Simmonds, who will be sidelined for the next two to three weeks with an upper-body injury, according to Hextall. That's a big blow for a Flyers team trying to hold on to its current playoff position as the NHL season heads into the stretch run. Simmonds, who had played in all 59 of the Flyers' games so far this season, has 37 points (20 goals, 17 assists) and has hit the 20-goal mark for the fifth straight season. He's also a crucial member of the team's power-play unit, where he leads the team with 10 goals, good for fifth in the entire NHL. "He's been playing some good hockey for us," forward Claude Giroux told NHL.com. "Wayne's a tough guy. Played a whole game with a pretty big injury. He's one of the main guys here in this locker room." Lindblom, who recently represented the Phantoms in the AHL All-Star Game in just his first full season in Lehigh Valley, is expected to make his NHL debut on Tuesday night against the Canadiens. In addition, the Flyers also announced that Neuvirth would be sidelined for at least the next month (and possibly as long as six weeks) with a lower-body injury he suffered in the first period of Sunday's 7-4 win over the Rangers, the same game in which Simmonds was injured. Mrazek and Alex Lyon, who picked up his first NHL win in relief of Neuvirth on Sunday, were both on the ice at the Flyers morning skate on Tuesday.